For thousands of years, the majestic elephant has roamed the African continent, as beloved by man as it has been preyed upon. But centuries of exploitation and ivory hunting have taken their toll: now, as wars and poachers continue to ravage its habitat, as disease and political strife deflect attention from its plight, the African elephant faces imminent extinction. What will become of these magnificent beasts? As the elephant's future looms ever darker, Martin Meredith's concise and richly illustrated biography traces the elephant's history from the first ivory expeditions of the Egyptian pharaohs 2500 years ago to today, exploring along the way the indelible imprint the African elephant has made in art, literature, culture, and society. He shares recent extraordinary discoveries about the elephant's sophisticated family and community structure and reveals the remarkable ways in which elephants show compassion and loyalty to each other. 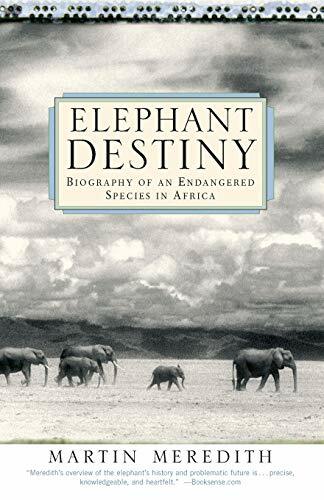 Elegant, illuminating, and urgent, Elephant Destiny offers a beautiful and important tribute to one of earth's most magisterial creatures at the very moment it threatens to vanish from being. Martin Meredith has spent much of his life writing about Africa: first as a foreign correspondent for the London Observer and Sunday Times, then as a research fellow at St. Antony's College, Oxford, and now as an independent author and commentator.